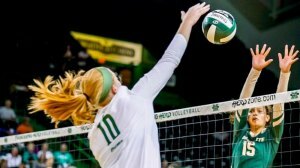 CHARLOTTE – The Marshall volleyball team fought to the end but ultimately fell in four sets (27-25, 15-25, 15-25, 25-27) to the Charlotte 49ers, Friday night. The Thundering Herd finish the season at 10-19 overall and 3-11 in Conference USA. The 49ers finish the regular season at 16-14 and 6-8 in conference play and grab the eighth seed in the upcoming Conference USA Championship Tournament. Seniors Shelby Conley and Lauren Mattmuller had great games in their career finales. Conley starred throughout the match and led the way with career-highs 17 kills and 17 digs. Mattmuller had 13 kills and hit at .524. Redshirt junior Jayden Jacobs and freshman Autumn Elswick each had 23 assists. Redshirt sophomore Ciara Debell recorded 13 kills and 15 digs. Junior libero Amber Weber finished with 10 digs. Junior Michaela Ahlenslager in her second-straight start recorded five kills with a .429 percentage and had three blocks. Freshman Mion Weldonrecorded four blocks. "It was fun to see Shelby and Lo (Mattmuller) have such a great finish but I'm sure they wanted the win," Herd head coach Mitch Jacobs said. "I thought Jayden set a nice match. Ciara was really able to get some things done. But, Lo and Shelby were just playing with everything they had and laying it all on the line out there. It's the next chapter you know and you move on. They were good kids all four years those two. I'm sure they will do great things in life." In the first set, Charlotte jumped out to the early advantage and led by as much as six, 17-11. Marshall chipped away at the lead and tied the set at 23-23 after a kill by Mattmuller. The teams traded points until the Herd got back-to-back kills by Conley and Debell to take the first set, 27-25. Charlotte controlled most of the way through sets two and three and led 2-1. The fourth set began as another battle until Charlotte started to pull away and led by as much as five at 17-12. The Herd rallied and fought back to tie the set at 22-22, 24-24 and again at 25-25. The 49ers were able to grab the final two points to finish off the match but not before Marshall left everything they had on the floor.